Forgot your iTunes backup password? Unable to restore your iPhone from encrypted backup in iTunes because you lost the password? The iTunesKey utility can save the day. iTunes backup password is encrypted by performing 10’000 iterations of PBKDF2-SHA1, therefore it’s relatively slow to break the password using CPU. In order to improve the password cracking speed, we have to put your GPU (Graphic Processing Units) to work. A high-end accelerator such as the NVIDIA GeForce GTX 1080 can crack passwords up to 250 times faster compared to a CPU alone. 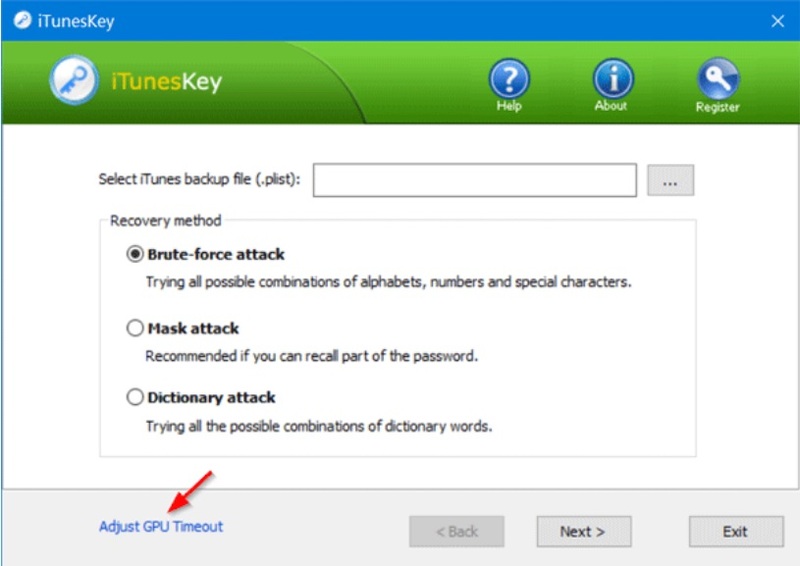 iTunesKey is the most effective tool for cracking iTunes backup password with CPU and GPU acceleration. In this guide we’ll walk you through the process of recovering forgotten password from encrypted local backup in iTunes. 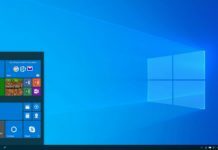 In order to perform intensive GPU computation on the graphics card, we have to increase the GPU timeout, that is 2 seconds by default in Windows. Just start the iTunesKey program, and then click the “Adjust GPU Timeout” link at the bottom-left corner. In the pop-up dialog, set the timeout to 30 seconds and click OK. To make this change take effect immediately, you have to reboot your computer. The program offers 3 types of password recovery methods: Brute-force attack, Mask attack and Dictionary attack. Brute-force attack – Try all combinations from a set of characters. Mask attack – Use this mode when you know part of the password or have any specific details about it. Dictionary attack – Attempt many different common passwords and possible passwords that are likely to be used by humans. To demonstrate, we will perform a brute-force attack. The brute-force attack will try every possible combination of letters, numbers and special characters. You just need to specify the length and composition of the password. For instance, if your iTunes backup password is a combination of one or eight numbers only, you can set the Minimal length to 1, set the Maximal length to 8, and then check the “Include digit (0-9)” option. After you clicking Next, the program will try every possible character combination as a password until the correct password is found. The number of possible combinations grows rapidly as the length of the password increases. If there is no GPU hardware detected on your computer, iTunesKey will automatically use CPU to crack your password and this could take much longer time than using GPU. 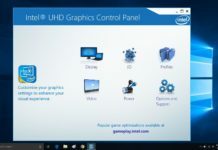 Almost all dedicated graphic cards support GPU, and the brute-force speed all depends on hardware. 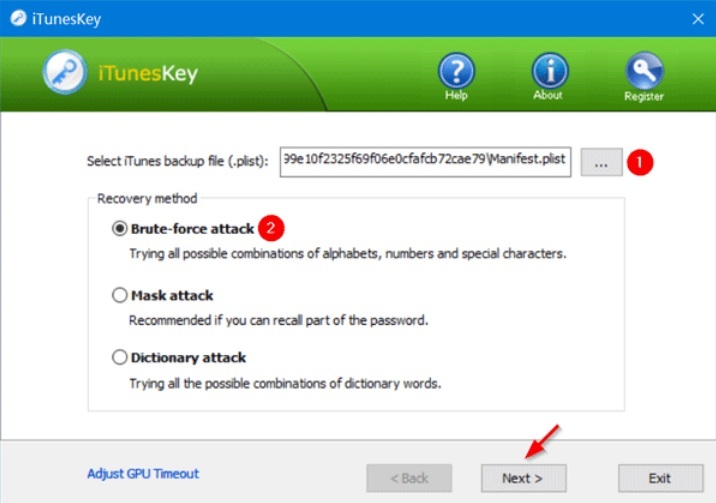 iTunesKey is a high-speed password cracking tool that can help you recover lost password for your encrypted iPhone/iPad/iPod backup in iTunes. It takes full advantage of GPU acceleration, so it performs incredibly fast.